Around here, bits and pieces of Yule are being brought out, hung up and created. The snowflake-making basket is on the table, ready for anyone who needs a moment to make something pretty. Eventually, all twenty-two of our windows will be decorated with unique and personal art, like little love notes to the season. 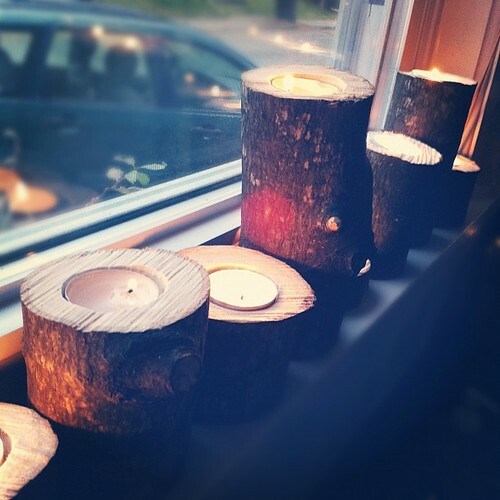 And yesterday, Alex made these candle holders for me from a downed maple limb. Simple and lovely, and so very sweet. He knows how I like to incorporate nature into our yuletide decorating, especially if it makes use of something that came from our own garden. If you too, are decking the halls in the coming days and weeks, welcome the quiet moments to create something simple. It will nurture you, your family and home. Your home is looking lovely Amy. I always enjoy seeing how you decorate for Yule and all of the other holidays. And the candle holders that Alex made are just perfect. Bringing light and joy in the darkest time of the year. I love those candle holders! Do you know how he made them? I just read the post about snowflakes ... since it was a couple of years old, I didn't comment there and will ask my question here. 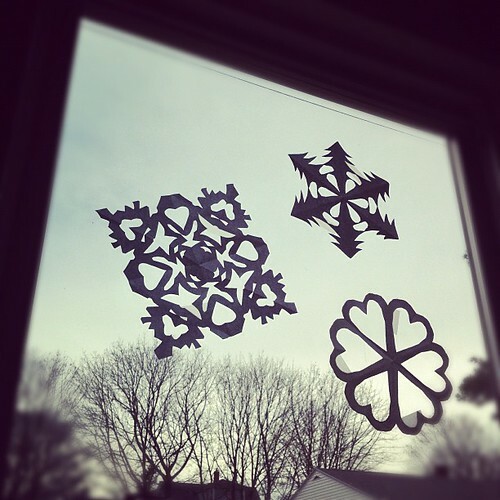 How do you hang the snowflakes up in the window? Are you just taping them on? Those candle holders are beautiful. Today we start our Christmas prep. I'm so excited to create with the kids. Lexa, joy and light to you also, and thanks! Melissa, Alex simply sawed different lengths of the limb then used a drill bit for making holes, that was the approximate size of a tea light and drilled down just enough on one end, as to hold a tea light and have it flush with the end of the holder. HTH, thanks! Cynthia, every year I consider using something other than tape, but we always end up using tape. I've thought of rubber cement, maybe? but haven't tried that. I just place the tape carefully and we try to save snowflakes year to year, but like the real thing, they don't always last. Thanks, Darcel! I know you enjoy *making home* as I do, and it's always such fun to create with little ones, too. Have fun!